Bachelor of Science in Journalism, 1951. As a reporter, columnist and legendary rewrite-man for the Chicago Sun-Times for more than 34 years, Hugh Hough produced thousands of major stories and columns. He set a standard of excellence in Chicago journalism with his secret to good writing: never use clichés. Hugh’s talent for writing didn’t go unnoticed. In 1974, along with Arthur M. Pectacque, also a University alumnus, Hough won the Pulitzer Prize for Local General Spot News Reporting. 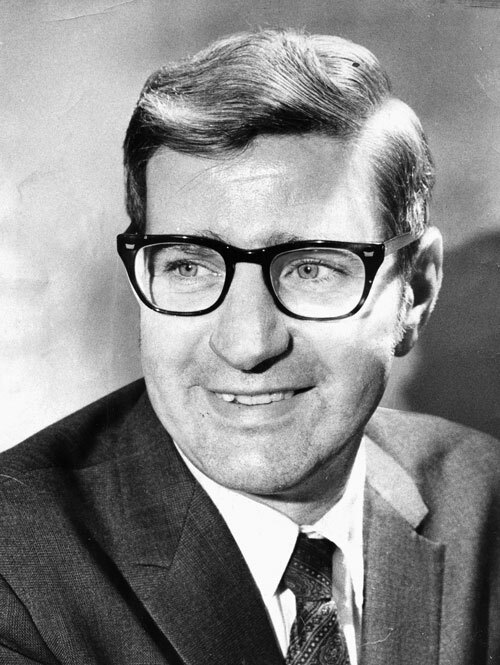 The team uncovered new evidence that led to the reopening of the 1966 murder case of Illinois Sen. Charles Percy’s daughter, Valerie. Rebuffing suggestions that he enter management and become an editor, Hugh was known for his unflappable nature and willingness to help out new reporters … and for his love of golf. Hough died April 18, 1986. That same year, a University scholarship fund was established in Hough’s name to provide a stipend each semester to a deserving University student enrolled in the College of Communications. This bio was written at the time of Hugh Hough’s posthumous inauguration into the 2007 Illini Media Hall of Fame.